Initially went to sea with P & O as Deck boy on Oriana, subsequently served with Bristol City Line until company ceased trading in 1969, then served with Port Line and Blue Star Line with occasional trips on coasting vessels. Migrated to Perth, Australia in 1972 where I worked briefly as a tavern manager, until attending college and gaining a certificate as Master 300t, limited to sail as Chief Mate. I then managed to get a job on Seismic Survey vessel Eugene McDermott, sailing as Mate, and after 12 months and being entitled to study leave, I attended college in Sydney and studied for 2nd. Mate, Foreign Going. I joined Stateships in 1983 and served as 3rd and 2nd Officer until 1986 when I again attended Sydney Technical College and studied for my Master's certificate. On attaining this, I returned to Stateships and subsequently was promoted to Chief Officer and in 1989 was promoted to Master. I served with Stateships until the company was closed in 1995 and the vessels disposed of. I joined the Seismic Survey company Geco-Prakla in the latter part of 1995 as master Geco Resolution. The company merged with Western Geophysical in 2000 and renamed WesternGeco. 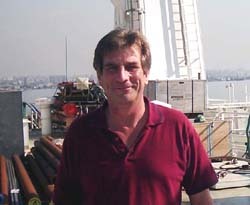 I am currently serving on their vessel R/V Gilavar carrying out seismic operations in the Caspian Sea. I still live in Western Australia and have a small olive grove in Margaret River.